Apparently, it’s that time. On Feb. 15 she’ll release her 13th studio album, Hello Happiness (Diary Records/Island Records). Its funky lead single, “Like Sugar,” arrived last June and sparked the global #LikeSugarChallenge, a testament to Khan’s staying power after 46 years in the business. Meanwhile, her current single, the new album’s title track, is a testament to her sunnier state of mind. The LP marks Khan’s first since she decided to enter rehab for prescription drug abuse following the death of her “brother,” and former NPG Records boss, Prince. That would have been something... I hope her new album will be good. I had found the last one quite substandard for Chaka, very generic sounding. "Rehab for prescription drug abuse following the death of her “brother,” and former NPG Records boss, Prince." H.M. Buff said in his Violet Reality interview that when he denied Chaka Khan the opportunity to play with 's guitar during the recording of Come 2 My House, scolded him afterwards: "You don't say "no" to the Queen". So must have really been in awe of her. “Prince and I had plans of having a label together but things didn’t quite work out. “It was going to be him, myself and Miles Davis, and we were also going to do an album together. It's funny because I've always said if Miles had lived, he'd either have ended the 90's working with Bill Laswell OR adding a 4th album to the Newpower Pak trilogy. However realistically I suspect Miles would never have taken the chance to release a record on NPG Records, Miles was beyond superstardom at this stage of his career, he was major material and probably wanted major money. 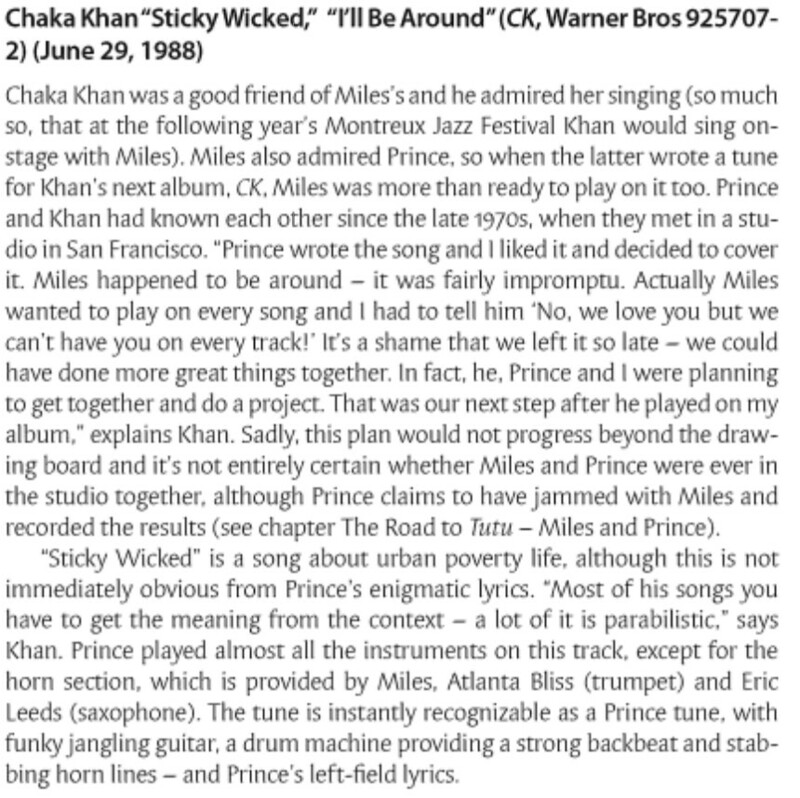 Now that statement by Chaka is challenging because I'm not sure when her problems with WB started, but Miles died in 91 so that would have meant that at some point before 1991, loooong before the Newpower Pak, she, Prince and Miles discussed the possibility of leaving WB to go indie, and that doesn't really add-up with what we know of the Prince/WB relationship. I wonder under which circumstances they discussed this. Three big egos in one studio? I'm sure there were many projects Prince talked about with potential collaborators during his career that never went beyond the discussion point. The most interesting are the ideas that were actually worked on before being abandoned. Thank you for the info. I used it in my Chaka Khan chapter on my princevswarners-blog and mentioned you in the Thank You-list of the Acknowledgments section for bringing it to my attention. Oh wow that would've been awesome. Cool. The whole book is worth reading, IMO. There's a small chapter about Prince. Nothing earth-shattering, but it was pretty good (and accurate) for 2005. Why did she cuss him out? Secondly, from what I heard from someone there, it had something to do with Larry and his influence on Prince. She knew at the time that Mayte wasn't into the JW thing and Chaka respected Larry's views but did not respect the way she felt P was being "brainwashed". If you really pay attention to Chaka's attitude on their interview on Vibe (June 98) and then BET Tonight (October 98), she was fed up by October. Prince tried to make amends by trying to get Come 2 My House distributed on Arista/BMG (without the NPG label) during his initial talks with Clive, but by that time, she was done. Ah, thanks. I don't think a lot of people were happy with the Larry thing. Chaka got her issues but she's no fool. What I was told about the incident I mentioned apparently had more to do with the tour itself, she wasn't happy with the touring conditions, IDK what exactly. But both stories do not necessarily exclude each other, it's very possible she was fed-up with a lot of different things and you know how things pile up when you start getting upset. Thanks for the thread. What a great collaboration to try, even just a few songs would be nice. Such a specific place and time back then for those 3 to do something experimental. They were all already famous, so it was artist not industry driven. producer Switch did a great job ! he did great with M.I.A.